Friday, April 12: In theory, every sporting event has the potential for creating history. A player could set a new single-game record in a wide variety of offensive and defensive categories but the nature of such deeds is that no one can predict when such an event will take place. Should it happen, however, fans would want to be there to witness it. In fact, DirecTV used this logic a few years ago to sell its “Extra Innings” MLB package and, for a couple of years at least, that pitch worked with me. As my work responsibilities increased, however, I no longer had the free time to invest in that chase, at least for baseball. In recent years, the focus of my pursuit has shifted to boxing and, as I write this, a reward is just around the corner. Tomorrow, I am almost guaranteed to sit in on history, for I will be traveling to Atlantic City to chronicle the hits and misses of a show topped by a fight billed as “the biggest women’s boxing match ever staged,” the showdown between two-time Olympic gold medalist Claressa Shields, a three-belt titleholder, and longtime WBO monarch Christina Hammer for the undisputed middleweight championship. Unlike past dream fights, such as Christy Martin-Lucia Rijker and Laila Ali-Ann Wolfe, Shields-Hammer has been signed, sealed and, barring any unforeseen circumstances, about to be delivered. While this is great news for the women’s game and for those who follow it, the undeniable truth is that Shields-Hammer will not be waged before the maximum audience possible, either live or over the airwaves. That’s because this unification fight is only part of a jam-packed weekend of fights – the ESPN+ card topped by pound-for-pound king and The Ring Magazine/WBA/WBO lightweight champion Vasiliy Lomachenko versus mandatory challenger Anthony Crolla on Friday, then two other Saturday night cards on DAZN and FS1 headlined by Jaime Munguia-Dennis Hogan on the former platform and Caleb Truax-Peter Quillin on the latter. While some may be driven away from the Munguia-Hogan show due to its being on a streaming service, Shields-Hammer will compete directly with the FS1 show for those fans who prefer to watch their fights on TVs instead of on phones, laptops and desktops. In addition to the tidal wave of boxing action, the general sports fan’s attention will be pulled by playoff games in the NBA and NHL as well as regular season MLB contests and a Master’s tournament in which the iconic Tiger Woods is in the hunt. While there will be complaints about the unfairness of the situation facing the Shields-Hammer show, I believe this scenario will offer a genuine, “real world” test of how much drawing power an elite women’s boxing match will have, under the most challenging of circumstances and in the very market it wants to conquer. Had Shields-Hammer been the only boxing attraction on this weekend’s docket, the inflated ratings and revenues might have made for a feel-good story but it wouldn’t have been a true measure of where the women’s game stands in the American sporting marketplace. Under this weekend’s scenario, however, Shields-Hammer will compete within a most challenging environment and, because the expectations will be low, any signs of strength will be reason for the sport’s adherents to cheer because those signs would be inarguable. Yes, the Shields-Hammer show is facing an uphill battle but, in women’s sports, uphill battles are a part of daily life. Will Shields-Hammer be the breakthrough fight its supporters say it is? Because of the scenario painted here, we will get an answer – a real answer. …in which Lucy Ricardo (portrayed by Lucille Ball) and her friend Ethel Mertz (played by Vivian Vance) were seated at a chocolate factory’s conveyor belt. The supervisor told them, in very stern terms, that their job was to individually wrap all the chocolates that came their way but should a single candy get by them, they would be fired immediately. At first, the candies emerged at a comfortable pace but, within seconds, the treats arrived with a speed no one could have handled. To avoid being fired, Lucy and Ethel went to extraordinary lengths to keep everything under control, including stuffing the chocolates into their mouths until they looked like chipmunks. After earning the approval of the boss following the insanely fast first wave, Lucy closes the scene by ordering the conveyor belt to move even faster. The live audience’s laughter was loud and genuine and those who watch it now can surely relate to the situation. As for me, each task is represented by a chocolate and the conveyor belt represents the ever-moving and always renewing “to do” list. But, for me, that’s as far as the comparison goes for two reasons. First, I couldn’t ask for a better boss than Bob Canobbio, who lets me work at my own pace (which happens to be fast), who often asks me if the pace is too much and has stepped in to help when absolutely necessary. Second, while the workload has been prodigious, it seldom has been overwhelming. I pride myself on my work ethic and time management skills and while both have been tested, they continue to serve me well and I expect that to be the case going forward, even as the conveyor belt continues to roll ceaselessly. Today’s “to do” list was pretty straightforward: Drive to Pittsburgh International Airport, catch a 1:10 p.m. flight to Philadelphia and drive the rental car to the Ocean Resort Casino in Atlantic City, a sprawling $400 million property that opened in June 2018 on the same site as the $2.4 billion Revel Casino that closed the previous September after just six-and-a-half years of operation. According to a story posted by CNBC’s Michelle Fox (https://www.cnbc.com/2018/06/28/ocean-resort-casino-opens-in-atlantic-city-with-eyes-on-sports-bettin.html) actor (and boxing aficionado) Mark Wahlberg placed the first bet at the new sports book, which, for the record, was for the Philadelphia Eagles to win the Super Bowl LIII. Every so often, I speak about coincidences that take place on my trips. I haven’t experienced any on my recent journeys but one involving food surfaced here. As I drove into Pittsburgh, the hosts of “Busted Open” (the five-days-a-week pro wrestling show on Sirius XM Channel 156) spoke about WWE Hall of Famer Mark Henry’s upcoming autograph signing in “The Steel City” and one of the first topics spoken about was the famed Primanti Brothers restaurant chain, primarily known for its signature sandwiches. Host Dave LaGreca sung Primanti’s praises to the point that Henry, his co-host for the day, said he would make it his first stop upon arriving in Pittsburgh. Fine and good. Over the years I’ve been made aware of Primanti’s; in fact, on my route home, I almost always take Exit 41 on Interstate 79 to buy my get-and-go dinner and just before I turn left onto the main drag, I see a sign for a Primanti Brothers outlet. However because the location would take me several miles out of my way, I never chose to drive there. But while the thought of eating at Primanti’s was planted by the “Busted Open” segment, it was fortified when, upon boarding the train to the airport’s “secure” area, I spotted a woman wearing a black Primanti’s T-shirt. One mention of something is one thing but two within a half-hour is worthy of intrigue. However when I scanned the list of restaurants in the airport and saw that a Primanti’s outlet was on the list – something I had never seen in all of my visits – I knew exactly where I was going to have an early lunch. After finding the location in the airport’s center core near the C and D terminal entrances, I took my seat in front of a pair of large screen TVs mounted on the wall. One was tuned to ESPN and the second round of The Masters while the other was on MLB Network. The female server for my table told me that the airport location opened just last month and, based on the dozens of people inside, business was good. Because it was my first visit, I decided to order one of its “Almost Famous” sandwiches – a pastrami and cheese on thick Italian bread – with a side of coleslaw and a Diet Coke. I refrained from ordering a side of fries and it was a good thing I did because, as expected, what I had would more than satisfy my appetite. From bite one, I knew that all the raves about Primanti’s were on the money – and more. The pastrami, so abundant that it overflowed the boundaries of the bread, had a robust smoky aftertaste and the bread, while thick, was soft yet not too chewy. I wasn’t sure whether I was supposed to put the coleslaw on my sandwich and though I thought about it, I opted to keep it on the side. While I’m no food critic – the late Jack Obermayer, the original Travelin’ Man, will always be the dean of diner critiques among boxing writers – I can say that I thoroughly enjoyed my first experience with Primanti’s and will make it one of my top options for Pittsburgh Airport fare. The flight from Pittsburgh to Philly was pleasingly uneventful, so much so that I spent the majority of it resting my eyes and, once I landed, an unusual, but welcome, part of the trip began. I almost always drive alone on my trips but this time I had a passenger – and a rather notable one. Earlier this week I received a text from International Boxing Hall of Fame executive director Ed Brophy, who, through his nephew Jeff, knew I was traveling to Atlantic City. Because our flights would arrive in Philadelphia within minutes of each other, he asked if he could catch a ride with me to A.C. “Of course,” I replied. Just like that, the deal was sealed. Since my plane arrived in Terminal C while his pulled into Terminal F, I needed to take the shuttle bus to avoid a second security check of my luggage. Once there, I met Ed in the center hub, then took a bus to the Avis outlet and secured my rental vehicle, a white Ford Fusion hybrid. I pulled out my cell phone and programmed the location of the Ocean Resort Casino into Google Maps but the usually 75-minute drive lasted 90 because of the heavy traffic on the Walt Whitman Bridge as well as on Route 42 leading to the Atlantic City Expressway. I didn’t mind the extra drive time because it gave Ed and me more time to discuss all things boxing: The Shields-Hammer fight, the upcoming 30th anniversary IBHOF Induction Weekend and other various Sweet Science topics. Our conversation not only lasted the entire drive, it extended into dinner, which took place at Rocco’s, which specializes in Italian fare. “Si,” she said with a bright smile. …as well as her numerous appearances on Argentina’s TyC channel on DirecTV. Once Acuna resumed her career in April 2001, the rest is history: A two-year reign as WBA junior featherweight titleholder that included a unification victory over WBC counterpart Alejandra Oliveras, a stint as WBC titlist that extended two more years and subsequent IBF and WBO reigns at 122. Should a women’s wing ever be established by the International Boxing Hall of Fame, Acuna should be a shoo-in first-ballot entry (along with Martin, Rijker and a group of others that spring to mind). 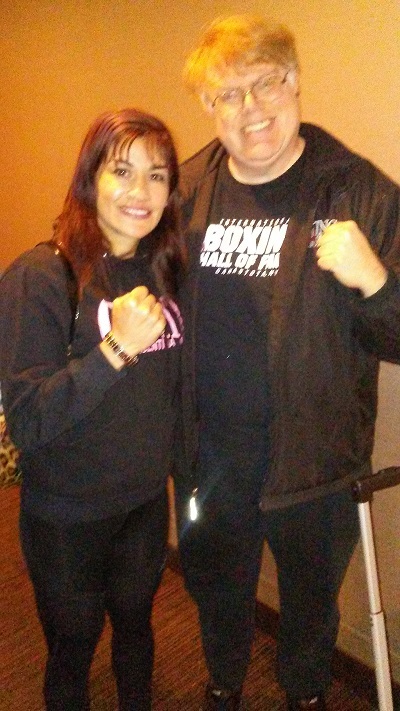 Although my Spanish is rudimentary at best, I was able to ascertain that the man in the red satin jacket was a cornerman and that Acuna was in Atlantic City to second the other woman in the elevator with us, who turned out to be Brenda Carbajal. Nearly 16 months after losing a majority decision to Rose Volante for the vacant WBO lightweight belt, the 28-year-old Carbajal (15-4-1, 9 knockouts) will be fighting on the Shields-Hammer undercard against 9-0 Russian Elena Gradinar for the interim IBF featherweight title that had been most recently held by Jennifer Han. Before parting for our respective rooms, I asked Acuna to pose for a picture, which she did. The second chance meeting took place just minutes later when I spotted Brophy chatting with former two-division titlist-turned-trainer Joey Gamache, who was serving as the chief second for Swedish heavyweight Otto Wallin, scheduled to fight American journeyman Nick Kisner (21-4-1, 6 KOs) in the Showtime TV opener. This was the first time I had seen Gamache since May 2013, when we were in London to work the Carl Froch-Mikkel Kessler rematch. Much has changed for both of us since then but especially for Gamache and not all of it has been good. According to a story in the Portland (Maine) Press-Herald, Gamache was attacked from behind by an assailant, who landed a punch that broke Gamache’s jaw in three places. Although he allows for the possibility of a random attack, he suspects it might not have been. Here, however, Gamache looked well and was eager to tackle his latest assignment with Wallin, a 6-foot-5 ½ southpaw with a 20-0 (with 13 KOs) record, a pinpoint jab and a tremendously powerful straight left. The other fight on the telecast will pit heavyweights Jermaine Franklin and 38-year-old Rydell Booker, who is fighting for the fourth time since ending a 12-year prison stint for a drug-related charge that occurred shortly after his only pro loss, a lopsided 12-round decision to James Toney in 2004. The 25-year-old Franklin is the clear “A-side” with his 17-0 (13) record and his promotional association with Dmitry Salita but, due to the lack of recent video of fights of any length, I have no idea how he will fare with this version of Booker, who I had not seen fight since the Toney match 15 years ago. After finishing dinner with Brophy, I headed to my room and logged into ESPN+ to watch the Lomachenko-Crolla undercard, joining the broadcast just as ring announcer Lupe Contreras was announcing welterweight Alexander Besputin’s 10-round decision victory over Alfredo Blanco. I then watched heavyweight Guido Vianello’s 49-second destruction of Lawrence Gabriel, welterweight Jose Rodriguez’s six-round decision over Ramel Snegur, middleweight Janibek Alimkhanuly’s 10-round victory over Cristian Olivas and Arnold Barboza’s third round TKO over former WBO junior welterweight titlist Mike Alvarado. Once the main telecast began, it was stunning to see the physique of WBO super middleweight beltholder Gilberto Ramirez, who had packed on more than 20 pounds since scaling 174 ½ the previous day. His upper body was markedly thicker yet was muscular enough to indicate just how grueling making 168 had been for him and how difficult making light heavyweight will be. Ramirez’s opponent Tommy Karpency knows beyond doubt that Ramirez’s vaunted body attack was enhanced by the extra pounds, for he said Ramirez’s blows in the fight’s first minute fractured his ribs. Ramirez’s numbers resembled that of his best efforts, for he averaged 79 punches per round to Karpency’s 42.3, out-landed the West Virginian 83-25 overall, 14-6 jabs and 69-19 power, created accuracy gaps of 26%-15% overall, 13%-9% jabs and 33%-19% power and prevailed 30-4 in landed body shots. In the final round alone, Ramirez out-landed Karpency 30-5 overall and 23-4 power, setting the stage for the surrender to come. 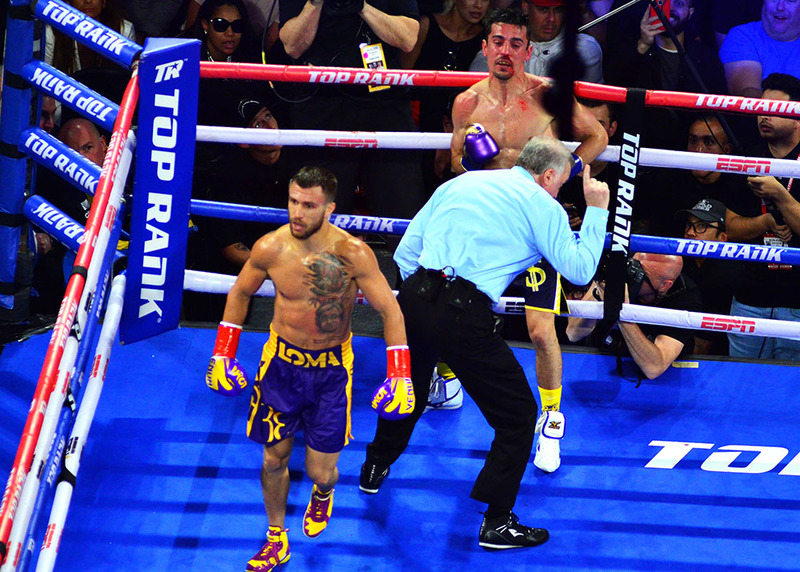 The main event between Lomachenko and Crolla confirmed the pre-fight expectations in terms of the final result but “Loma” made the predictable look spectacular. Any doubts about the state of his surgically repaired right shoulder were put to rest, for the final hook to the temple produced a sickening sound upon impact and robbed the durable Brit of his equilibrium for an uncommonly long time. The CompuBox numbers were equally emphatic: Lomachenko averaged 75 punches per round to Crolla’s 28.9, out-landed the challenger 72-12 overall, 14-5 jabs and 58-7 power, landed at a higher rate (29%-13% overall, 13%-11% jabs, 42%-14% power), prevailed 12-2 in body connects and dominated range with the jab (33.7 attempts/4.2 connects per round to Crolla’s 13.6/1.5). 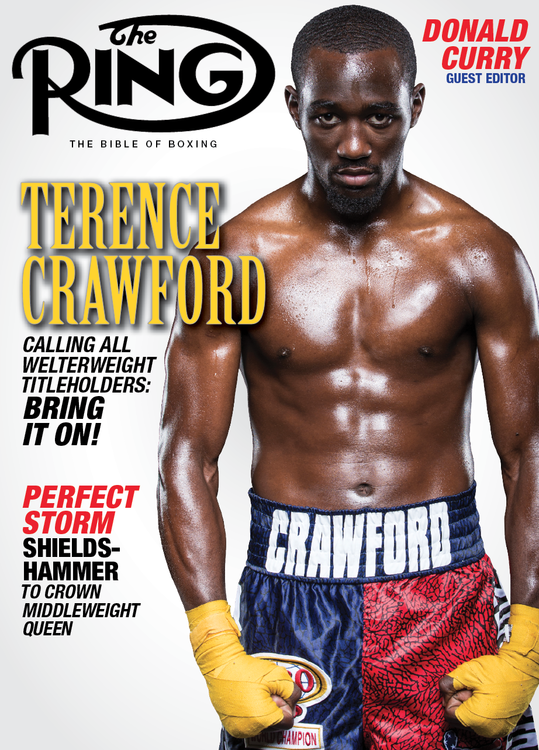 The race for pound-for-pound supremacy between Lomachenko and Terence Crawford has been debated for more than a year and some may believe the Ukrainian’s performance will place extra pressure on Crawford to top it. If “Bud” can produce a similar result against Crolla’s countryman Amir Khan, who occupies a higher rung on the ladder in terms of reputation and talent, then he will persuade more than a few Lomachenko partisans to take a second look at Crawford’s place on their lists. At the moment, I have Lomachenko ranked above Crawford by the smallest of margins due to the spectacular nature of his ring work but should the Nebraskan flatten Khan as Breidis Prescott, Danny Garcia and Canelo Alvarez did, his pro resume, superior to begin with thanks to his four-belt unification at 140 and his dominant welterweight showings against Jeff Horn and Jose Benavidez Jr., may put him over the top on my list. Not long after Crolla was put to sleep, I did my best to put myself to sleep. Saturday, April 13: I awakened after six hours of pretty restful slumber and I spent much of the day producing most of the words you’ve read so far. I received a phone call from punch-counting colleague Aris Pina, who told me he would be arriving in Atlantic City by bus shortly after our call time of 2 p.m. and at the arena via taxi sometime afterward, which freed me up to drive to Boardwalk Hall at a time of my choosing, which turned out to be 1:15. I programmed the arena’s address into Google Maps but previous experience confirmed by Showtime production supervisor Nikki Ferry told me that, in order to enter the building, I needed to drive up a ramp not covered by Google. Once the security person checked off my name on the entry list, I found a parking space near the production truck, secured a bout sheet, confirmed the order of the names with graphics ace Joe Jacovino, walked to my work station at ringside, set up shop and confirmed that all the lights that needed to be on were on. Aris arrived at the arena shortly after the crew meal and, after looking at the bout sheet, we decided to do something that we’ve never done on a given show – count every fight on the card. Good thing we did, too. Kicking off the card was middleweight Isiah Seldon – the 30-year-old son of former WBA heavyweight titlist Bruce Seldon – against 5-9 Georgia journeyman Bryan Goldsby. A combination drove Seldon across the ring before dropping him heavily near the neutral corner pad but, after arising, Seldon went on to win every subsequent round on his way to 58-55 scores across the board. Seldon was more active (45.5 punches per round to Goldsby’s 35.5), led 73-54 overall and 59-39 power to offset Goldsby’s 15-14 edge in landed jabs and prevailed 27%-25% in overall accuracy as well as 39%-33% in power precision. The fourth was Seldon’s best as he landed 46% of his power punches to Goldsby’s 14% while also leading he led 18-4 in total connects and 16-3 in landed power shots. The next fight turned out to be the upset of the night as Washington, D.C. junior featherweight Marcus Bates scored a third round corner retirement over Fort Worth’s Jesse Angel Hernandez, whose cut over the left eye was deemed too severe by the ringside physician. The far shorter Bates (now 9-1-1, 8 KOs) smartly circled the ring and nailed Hernandez (now 12-3, 7 KOs) with sharp counters, one of which was a right uppercut in round two that opened the cut over Hernandez’s left eye. Bates stunned and nearly floored Hernandez with a right to the chin in the final minute of round one and round two saw both men staggered by sudden strikes. Bates won the third round with his hit-and-run tactics that worsened the cut to the point that the ringside physician intervened. Hernandez was more active (53.7 punches per round to Bates’ 38.7 but Bates led 44-26 overall, 14-12 jabs and 30-14 power due to his accuracy leads of 38%-16% overall, 33%-12% jabs and 41%-22% power. Surprisingly the shorter Bates was the more successful jabber (14 attempts/4.7 connects per round to Hernandez’s 32/4). Both Aris and I were impressed with what we saw from Bates and hopefully he’ll get a TV fight sooner rather than later. The surprising result produced by Bates was followed by another as 38-year-old former heavyweight titlist Samuel Peter lost an eight-round split decision to Mexican journeyman Mario Heredia, whose record advanced to 16-6-1 (with 13 KOs) while Peter’s dropped to 37-7 (with 30 KOs). Peter was fighting for the second time following a 26-month break from boxing and, to these eyes, he did enough to earn the “W.” The reasons: He scored the fight’s only knockdown with an overhand right in round three. Second, according to the CompuBox round-by-round breakdown of total connects – relevant because clean punching is a key scoring factor – had Peter ahead 5-3, a margin he earned in the final three rounds in addition to scoring the knockdown. Third, Peter was the more active fighter as he averaged 48.9 punches per round to Heredia’s 31.8. Fourth, Peter, not known as a jabber, nevertheless out-performed Heredia in that category (27.4 attempts/6.0 connects per round to Heredia’s 13/4). Finally Peter prevailed 122-98 overall, 48-32 jabs and 74-66 power. So why did Heredia win? First, he was the more accurate puncher as he out-performed Peter 39%-31% overall, 31%-22% jabs and 44%-43% power. Second, aside from the knockdown, he eagerly traded with the power-punching Nigerian and he did have two excellent rounds in the first (in which he led 15-13 overall) and the fifth (where he prevailed 20-13 overall). Third, when he threw, he landed and did so with impact. He landed 54% of his total punches to Peter’s 33% in the first and led 41%-24% in the fourth, 61%-26% in the fifth and 32.4%-32% in the seventh, rounds he could have won. Nonetheless the crowd voiced its displeasure at the final result (77-74 and 76-75 Heredia to offset a 79-72 score for Peter) and I agreed with them. Next up was junior bantamweights Jarico O’Quinn and Vicente Martinez, which paired an 11-0-1 (with 8 KOs) prospect from Detroit in O’Quinn with a Minnesota-based Mexican with a deceptive 9-4 (with 3 KOs) mark, deceptive because (1) he came into the bout on a three-fight winning streak and (2) two of those wins came against the 9-0-1 John Franklin (UD 8) and the 12-0 Jonathan Perez (TKO 5). Whatever factors powered Martinez to his recent run of success weren’t present against O’Quinn, who, despite being the taller man, applied steady pressure, unleashed consistent volume (57 punches per round to Martinez’s 26) and utilized an effective body attack that logged 56 connects to Martinez’s 10. Martinez had no answers for O’Quinn’s approach, so he spent most of the fight on the retreat and the hopes of making it to the final bell. That he did but his numbers paled to those of O’Quinn, who led 103-30 overall, 22-7 jabs and 81-23 power as well as 23%-14% overall, 11%-7% jabs and 31%-22% power. 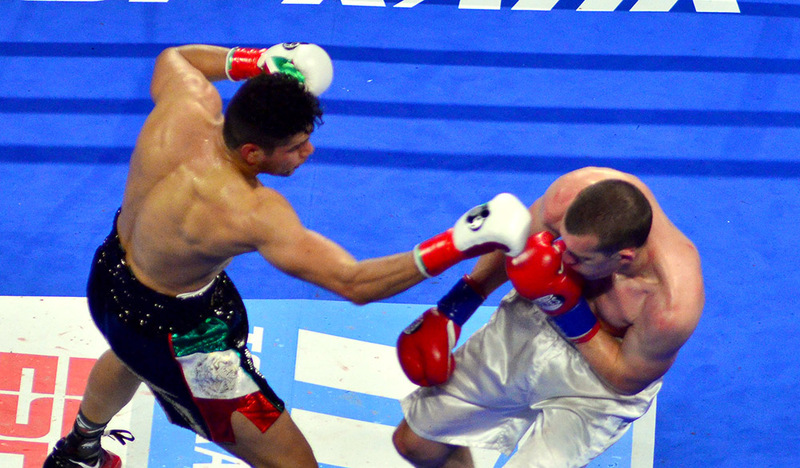 The final pre-TV bout paired Carbajal and Gradinar for the “interim” IBF featherweight title and, like Heredia against Peter and Bates against Hernandez, the blue corner fighter – otherwise known as the perceived “B-side” fighter – came out on top and deservedly so. While the 9-0 (with 2 KOs) Russian took the fight to Carbajal, her punches lacked snap, accuracy or strategy while Carbajal had the look of someone following a set game plan. In fact, Gradinar’s most effective weapon was her head, which repeatedly struck Carbajal’s face and, at the end of round seven, opened a cut over the right eye. Because Carbajal soldiered on, she went on to win 97-93 on two scorecards while prevailing 96-94 on the third. The numbers backed up the judges, for Carbajal was more active (46.3 punches per two-minute round to Gradinar’s 39.1), more accurate in terms of overall punches (19%-14%) and in power punches (23%-16%), the more prolific striker (88-55 overall, 66-31 power to offset Gradinar’s 24-22 edge in landed jabs) and ahead 9-1 in the CompuBox round-by-round breakdown of total connects. With the undercard completed, Aris and I headed into the homestretch of our long night of counting – the ShoBox tripleheader featuring Wallin-Kisner, Franklin-Booker and Shields-Hammer. As we looked around the arena, we noticed that most of the seats were filled, an encouraging sign, given the reports of poor advance ticket sales. Would the main event live up to its build-up? Or will it be anticlimactic? We would soon see. Cormier: Khabib is Crazy, Mayweather Will Beat Him Up Bad!